Yeah, it may well happen if you come across a motorcycle-only checkpoint. I’ve written previously about how motorcycle safety outweighs individual liberty as state and local governments have begun to implement motorcycle-only checkpoints that unfairly target motorcyclists for inspection by law enforcement officers. Specifically it’s called the “Motorcycle Law Enforcement Demonstration Grant” (DTNH22-10-R-00386) and the motorcycle-only checkpoints are funded by grants given out by the federal government, through the National Highway Traffic Safety Administration (NHTSA). That’s correct. The National Highway Traffic Safety Administration (NHTSA) is offering federal funds to expand the practice of creating motorcycle-only checkpoints by law enforcement agencies. Initially started in New York State, the process involves setting-up checkpoints where only motorcycles are pulled over. 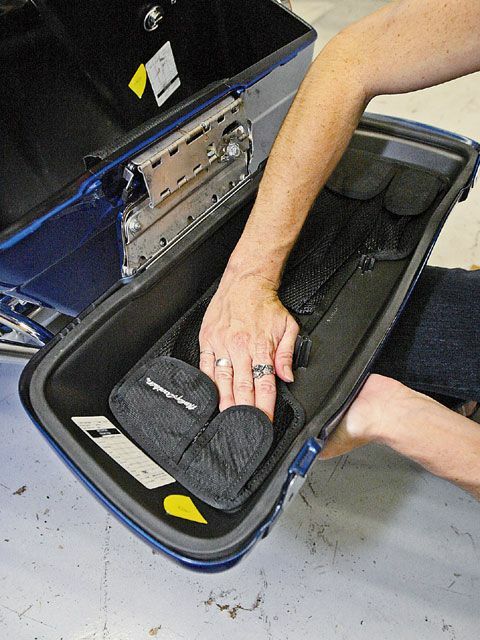 Law enforcement officers will check for U.S. DOT-compliant helmets, legal exhaust systems, and compliance with licensing, registration and inspection regulations. And they may decide to dig through your saddlebags! Sign this petition which calls for the cessation of the NHTSA’s direct and indirect funding of the motorcycle-only checkpoints through its grants and other measures, and asks that the laws for vehicle conformity and passenger safety be applied equally to motorcycles and automobiles alike. Why This Petition Site? The White House’s “We the People” website is the only one that sends a message directly to the president. 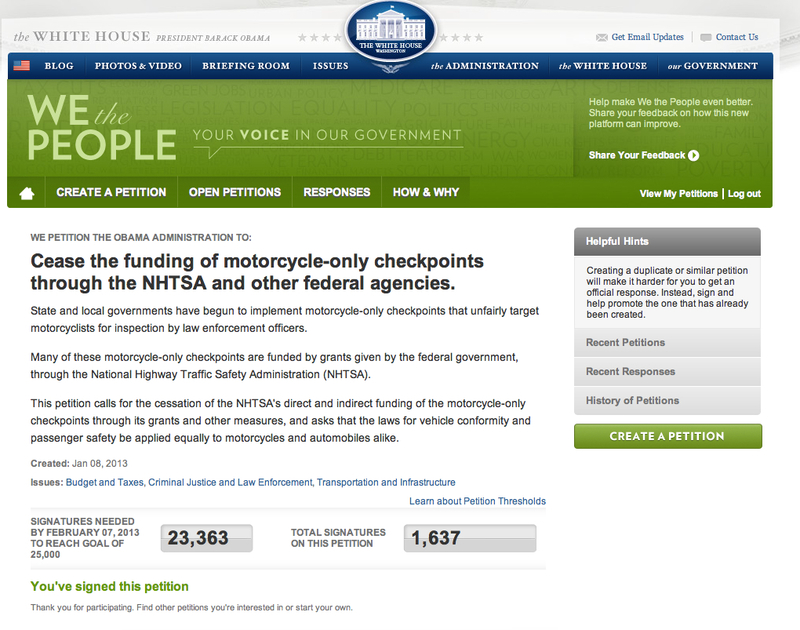 Once 25,000 signatures are reach, the petition is put in front of President Barack Obama, where he has to officially respond to the petition, which could include directing the NHTSA from funding motorcycle-only checkpoints. I Live In A State With-Out Motorcycle-Only Check Points, Why Should I Bother To Sign? Because there are a large number of motorcyclists in the U.S., yet overall our passion is shared by only a small portion of the population. This makes it relatively easy for laws, and those who enforce those laws, to target motorcyclists unfairly. The motorcycling community needs to come together, regardless of how this one issue affects you, in order to ensure that the basic rights of motorcyclists everywhere are assured. This Won’t Change Anything, So I’m Not Going To Waste My Time. You might be right, but putting the issue in front of The President of the U.S. might do something, and if nothing else, it shows that the motorcycle-riding community is an active participant in what occurs in Washington D.C. and in the local legislatures. Doing nothing truly means that nothing will change. Crap, I Have To Register To Sign This. Are You Kidding Me? The White House’s “We the People” website is the only site that sends a message directly to the president, and if there are enough signatures, the president has to formally respond to the petition. Please take the time and consider signing the petition. Photos courtesy of Baggers Magazine and The White House “We The People” website.